If you’ve been following this space for a while, you probably know that we kinda have a thing for cake pops, those adorb little bites of heaven that have created a frenzy on the dessert scene. And let’s face it, it’s hard not to fall utterly, head-over-heels in love with these little treats on a stick! Did you know that cake pops are super versatile and lend themselves beautifully to several #cake-pop moments that you simply must try? Read on for more! It’s been a long day; you’re totally stressed out and you need a quick sugar fix to get your mojo back but you don’t want another brownie or pastry! You need something that’s different; that’s fun; that’s not run of the mill…you need a cake pop! Combining the traditional sophistication of gourmet cakes with the fun quirkiness of lollipops, cake pops are designed to snap you out of those boring dessert blues! 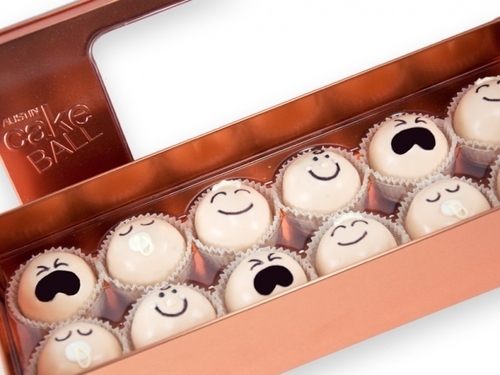 Stress busting balls have never been this gorgeous…or yum! 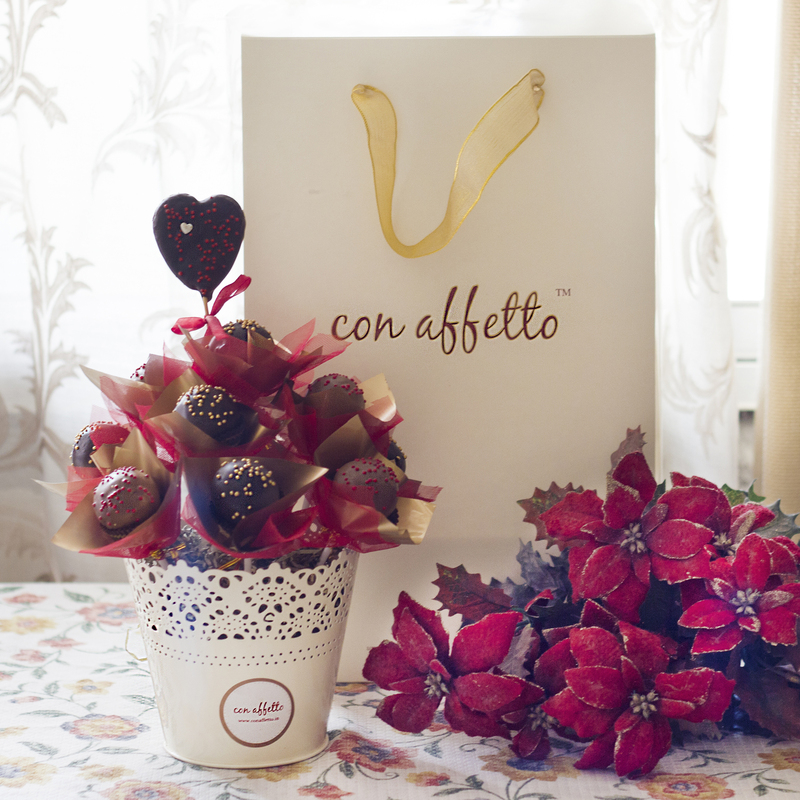 Try a signature Con Affetto ‘Have a Ball’ cake pop bouquet and watch all that stress melt away! For when you need (sweet) middle of the day inspiration! Did something go POP in your head yet? We sure hope so, because ALL of the above are perfect cake pop pick-me-up occasions! These bite-sized handy desserts will melt in your mouth, giving you just the right amount of pop-me-up, yet without making you feel like you’ve eaten too much. Bring back the sunshine into your life with our gorgeous ‘Hello Sunshine’ bouquet; we recommend our succulent red velvet cake pops, wrapped in golden sunshine! The girls are coming over for an evening of goss! You have the perfect finger food menu going; dainty cucumber sandwiches, mini kebabs, crusty quiches….and…you really don’t want an old fashioned tea cake but something funky to add a little…POP! Cake pops are oh SO perfect for afternoon teas, high teas and even for parties; they add a bite sized touch of glamour and deliciousness to any occasion. Add a dollop of oomph to your afternoon tea party! Luxury, decadence, sin! Look no further than our Pop & Drink luxurious cake pop bouquet to add some bubble and fizz and plenty of oomph! 4. And the children just adore them! Charm the young uns with our adorable Little Pearls edible bouquet; guaranteed to delight mums, mums-to-be and kids alike! The Ballerina cake pop bouquet: an ode to lovers; not just of beauty, but the arts and desserts as well 😉 A quick nibble won’t topple you off the fitness bandwagon and you can spread some joy by sharing the rest! It’s a special occasion and you’re looking for a gift but you want something funky, not the regular cake and flowers routine. With cake pops you’ve hit the sweet spot! With their heart stealing good looks, innovative designs and the smorgasbord of flavours and toppings, cake pops make for one unique gift that is not just guaranteed to wow, but that can also be tailored to suit the occasion– think football themed cake pops for the sports fan or GOT themed cake pops (yup, true story!) for lovers of the Thrones. Need the perfect gift? Look no further. Need that perfect, unique, funky gift? Purple It Up with this creamy and decadent cake pop bouquet! Whether it’s road trips or picnics, or even a busy day whizzing around town, with cake pops you’re always good to go. Cake pops are mess and fuss free by design; they are spill proof, don’t drip and are leak free. So get a box to go and bring on the travels! Cake pops to go…on the go! Did you know that cake pops and road trips were a match made in (travel) heaven? Colour up those travels with this vibrant bunch of gorgeous edible blooms; bursting with colour and road trippin’ joy! Is your cake pop moment calling out to you yet? Hurry up and order one of our gorgeous cake pop bouquets today! This entry was posted in desserts, edible bouquets, fun stuff, gifting, gourmet baked products and tagged cake balls, cake on a stick, cake pop bouquets, cake pop moments, cake pop occasions, cake pops, cake truffles, cakesickles, edible bouquets, funky dessert cake pops, handrafted cake, theme based cake pops, versatile dessert cake pops on June 24, 2016 by Manasi Vaidya. Close your eyes and imagine a burst of delicious decadence melting over your taste buds. Dense, sweet, soft, just the right bit of moist, crumbly…could it be… cake? But wait! It’s also cool…almost crisp, smooth, an explosion of fun…and it’s on a stick! Cake…Lollipop…Confused? Don’t be! Say hello to the newest entrant on the desert scene: the CAKE POP! Combining the best of two delightful worlds, cake pops marry the traditional sophistication of a tea time cake with the fun quirkiness of lollipops. So how did cake pops come to be in the first place? They have a really interesting and totally yummy history! Cake pops evolved from cake balls which originated to make something out of leftover, potentially stale cake. So you would have all this scrummy leftover cake, crumbed and rolled into balls with icing or other binding ingredient and then coated with chocolate or some other sweet exterior (much like donuts). A fabulous way of creating something awesome out of leftover cake! 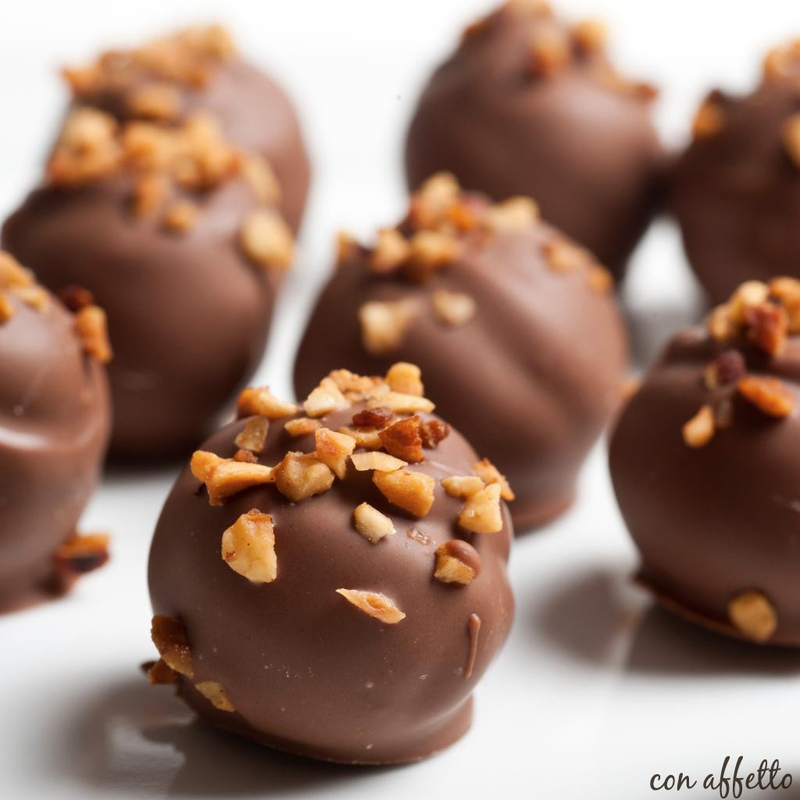 Cake balls became so popular that bakers began making them from scratch; without waiting for the leftover cake that needed to be salvaged. This then led to that light bulb moment: why not put a cake ball on a stick? And voilà! The cake pop, as we know and relish it, was born! And then, the well known cake pop Queen herself, Bakerella (also known as Angie Dudley), really put the spotlight on cake pops with her delightful, spectacular creations and before you could say ‘POP!’ cake pops were popping up all over the world from home chefs, to bakeries to Starbucks, which now serves cake pops in a variety of flavours! 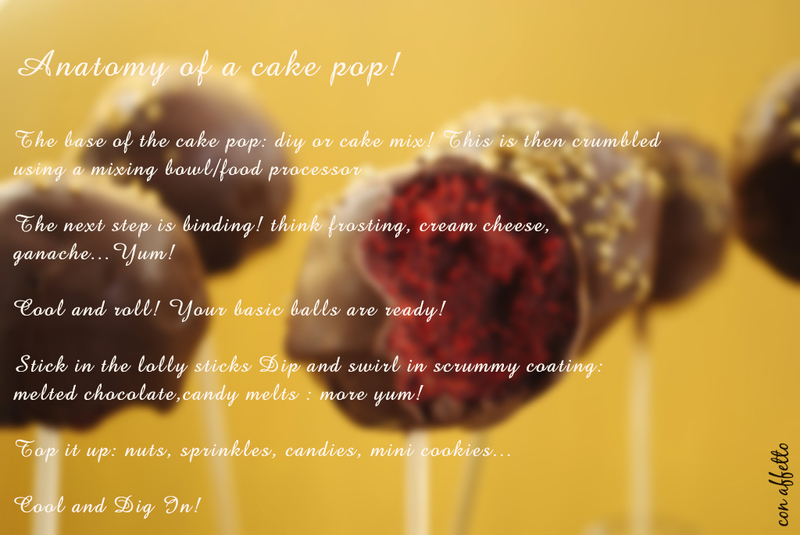 So let’s dig right into one of these scrummy-licious creations and see what really goes into the making of a very basic cake pop- layer by delicious layer. For a detailed Con Affetto special recipe, watch this space; we have something pop-tacular coming your way SOON! Absolutely swoon-some aren’t they? 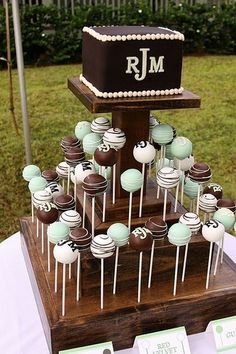 What’s more, you can use your creativity and personalize your cake pops as you wish. Go ahead and experiment with cake flavours, or, if the fancy strikes you, play around with a variety of ice cream sundae like toppings. Don’t be afraid to throw a bit of your personality into them as well; from Harry Potter pops to Disney princess pops, cake pops are popping up pretty much everywhere! They make a stylish alternative at theme based events; think bride and groom themed cake pops at weddings or pink and blue baby pops, just perfect for a baby shower! Take a look at these 27 insanely clever cake pops you won’t believe exist! Kim Kardashian cake pops anyone? 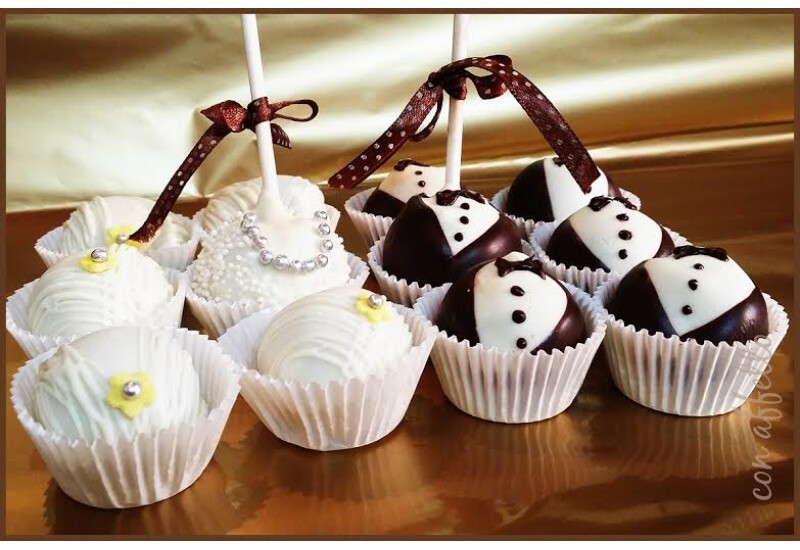 Bride and groom themed cake pops for a pop-tacular wedding! The great thing about cake pops is that they are a versatile, go-to dessert. They make the perfect bite sized offering for adults at an afternoon tea, are a fun, insanely popular option with kids at birthday parties and make a stylish alternative at formal events or for corporate gifting. Bite sized, versatile, stylish; cake pops are THE go-to dessert! This bite-sized, handy dessert is also great for the weight conscious; it lets you have the best ever combination of cake and a melt-in-your-mouth topping without making you feel like you’ve eaten too much. 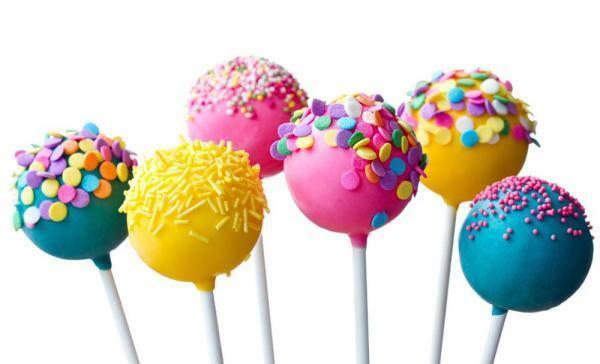 What’s more cake pops look absolutely fantabulous! All you need to do is make sure there are enough to go around; they’re so delicious that they do tend to have a tendency to POP into thin air and vanish! 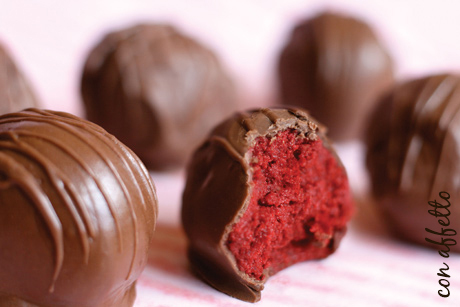 Have you eaten one of these incredibly yummy delights? Or, is there anything more you’re craving to know about these yummies-on-a-stick? We are waiting to hear from YOU! 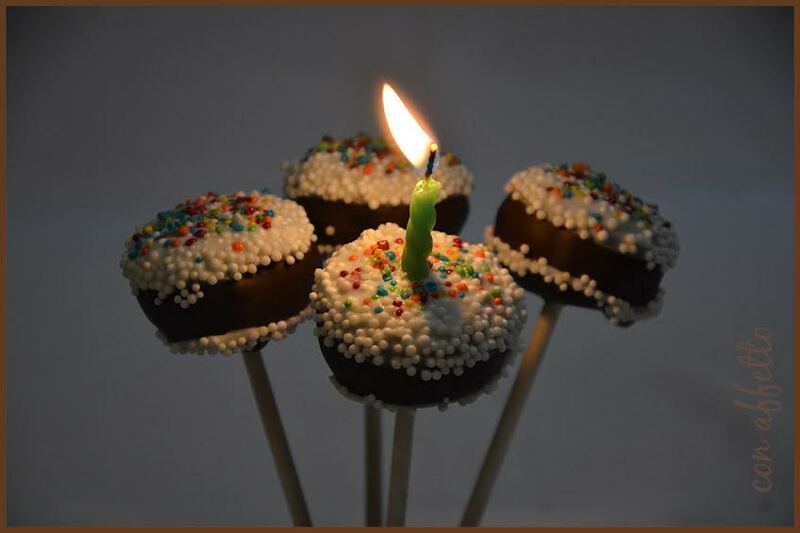 This entry was posted in baking, desserts and tagged Bakerella, baking, bite sized dessert, cake balls, cake on a stick, cake pops, edible bouquets, fun versatile dessert, history of cake pops, theme based cake pops on October 6, 2015 by Manasi Vaidya.